Could The Weather Determine Tuesday’s Election Results? 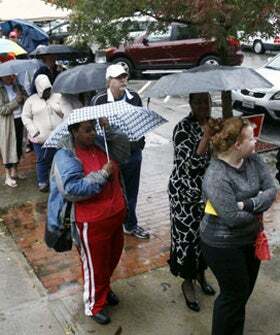 It looks like Hurricane Sandy isn’t the only weather that could have an impact at the polls. Whether it rains — or not — on Election Day may also affect the results. According to a 2007 study that examined election results and weather reports from 1948 to 2000, Republican presidential candidates get a 2.5% boost for every inch above average rainfall in a county. The study also showed that rain reduces voter participation by about 1% per inch, which may seem paltry, but could make a big difference in a race as tight as this one. In fact, the study found that weather may have contributed to the outcomes of the 1960 and 2000 elections (which were both extremely close, as you may remember). A poll by The Weather Channel in September supports the theory: About 28% of Obama supporters said bad weather could keep them away from the polls, compared to 19% of Romney supporters. And 35% of undecided voters said snow or rain would have a “moderate to significant” impact on whether they cast their vote.